The typical question of the day. What’s on your agenda? Mine usually consists of a myriad of things. If it’s a work day, it may include meetings, review of marketing documentation, filing trademark applications and running a budget report. If I’m at home, it may include running errands, dusting, sweeping, laundry, watering flowers and mowing the yard. 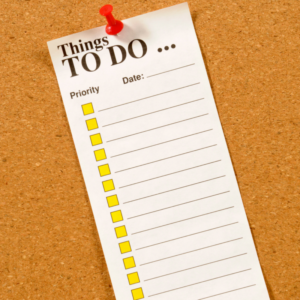 Some days our to-do list exhausts us just looking at it or thinking about it. We go as fast as we can to get as much done as possible to be able to sit down exhausted in the evening falling asleep during conversation. If we stop and really looked at what is on our to-do lists for the day, does it include sitting at the feet of Jesus? Does it include a little quiet time to listen for the Holy Spirit’s prompting or to read a few Bible verses and spend just a couple minutes in prayer? Or would it even include an hour of giving up chore time to study the Bible and pray? That seems like an awful lot of time on a day full of errands and chores! But it’s God’s time. It’s His day. He directs our path. Yes, we have to get our work done and keep an orderly house and bills paid but let’s start our day by sitting…in silence…listening to the One who will direct our day. Do we dare ask what’s on HIS agenda for our day? Yes, it’s scary to think it might be something we don’t want to do or don’t have time to do but if we can give up our to-do list for the to-do list of our Heavenly Father, I guarantee we will have a productive day along with a joy-filled day. Think about it. Now what’s on your agenda today? This entry was posted in devotional, inspirational, motivational, spiritual on May 11, 2018 by Deanna Young.